Ok, I know I promised you a hot stove article today and I’ll still deliver on that. However, in the mean time, all you Cardinal fans will enjoy this cartoon (used by permission) found over at toonrefugee.com. If you enjoy this one be sure to jump over and check out the rest of his sports cartoons too. There are some great ones. Enjoy! On stltoday.com Derrick Goold has a fantastic article about "What is a World Series worth?" If you haven’t read it yet, make sure you do. Eck, talks about having to prove that a team could win with him at short stop. That’s something that’s always baffled me. I understand he’s a bit undersized and not your prototypical body type for short, but wouldn’t you take 9 players who had so much passion and fire for the game? I’d love to see a team made up of "gritty" players who run down to first on walks and slap singles to the opposite field or turn on the occasional pitch, driving it out of the park. 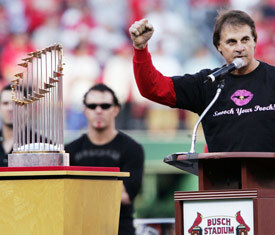 To me, Eckstein is the perfect World Series MVP for the Cardinals. This team did nothing pretty. They ground out the regular season. They played hurt and were told that they didn’t even belong in the post season. Yet, in the end, they proved everyone wrong. Just as Eckstein has proven every doubter he’s ever had wrong… yet again. Oh, P.S. – I’ll finally start blogging about the off-season tomorrow. I just wanted to wallow in the World Series win for at least a week. I STILL can’t believe they did it! Alright, my mom actually sent me this picture so I have no idea who took it or where it was found. I usually like to cite my sources but this picture is too good to pass up. To me it lets you into the clubhouse a little bit and see what it was probably like for them to win it all this year. Also, there were a flurry of articles today in the Post Dispatch about the offseason. Apparently Tony LaRusa and Walt Jocket had two days worth of meetings to draw up a game plan so I’ll sit down and write out what I would like to see happen before too long. I promise, it won’t take me two days, but then again I’m not doing this for real. Until then, enjoy the picture. The Cardinals won the World Series a mere four days ago. Four days ago the city, players, and fans were floating above the clouds, reveling in the unexpected championship. Just two days ago, Cardinal Nation was treated to a victory parade through downtown St. Louis, ending at a stadium filled with adoring fans. Yesterday, a mere three days after the end of the World Series, the stories in the St. Louis Post Dispatch were looking ahead to next year. Jeff Gordon wrote this article, discussing the different tasks ahead for general manager Walt Jockety. Joe Strauss wrote this article depicting how different the team could look next year. While looking forward and assessing all these possible changes will be necessary at some point, but can’t we sit back and enjoy the victory a bit longer? Have we learned nothing from the Yankees and now even the BoSox who’s fans seem to be perpetually disappointed unless their team wins it all each and ever year? Sure I’ll be posting on the off-season moves that will need to be made, but for now, I’m still pinching myself and I couldn’t be enjoying the off season more. Well, for all you fantasy baseball, football or basketball fans (do they even have Fantasy Hockey?) I figure this site will be right up your alley. ProTrade is a game based on stock trading but rather than stocks, you are buying and selling players. You can buy or sell shares of Pujols, Tom Brady, Johan Santana, Dwayne Wade and many many more. I’ve not played around with it too much yet but it looks like a lot of fun and probably a BIG time waster. Anyway, enjoy! Mark McGwire belongs in the Hall of Fame. Yeah, yeah, I realize I’m a St. Louis fan and therefore have a skewed perspective on this whole issues (which I’m sure we’ll all be fed up with come early January) but at least hear me out. Right now the only reason McGwire isn’t an automatic first ballot inductee is the suspicion of steroid use, and his well publicized refusal to "talk about the past". Now, don’t get me wrong, these are very valid reasons. No one was more angry with McGwire’s performance in front of Congress than I was. No one hates the idea that the game we all know and love, has been tainted by performance enhancing drug use. We can no longer just enjoy the game. There is a hint of doubt every time we see a home run hit. That’s just the way it is. But, can we keep Big Mac out of the hall for that? Are we going to make him the sacrificial star and act like as long as we keep him out of the Hall of Fame, that all our records are clean and clear and the game doesn’t still have a problem? In 1998 baseball returned to the national forefront. MLB officials (including commissioner Bud Selig) at the very LEAST looked the other way, as steroid bloated sluggers hammered a record number of balls out of the park. Managers pretended not to notice, and other players kept quiet or started taking ‘roids themselves. Everyone in baseball shares the blame for allowing steroids to corrupt the game. So, this brings us back to McGwire. Did he use steroids? More than likely yes. We still don’t have much hard evidence but I think its reasonably safe to assume so. But, keeping McGwire out of the hall without rock solid evidence (like a failed drug test) would set a precedence that I don’t think most voters are willing to stick to. By that standard you would have to keep not only McGwire out, but Sosa and Bonds out as well. We have just as much, if not more evidence of Barry Bonds’ steroid use than we do of Mac’s. Keep in mind, Big Mac never failed a drug test like Raffy did after angrily point a finger into the camera and proclaiming his innocence. Even fan favorites, such as Roger Clemens, have been implicated in different steroid investigations. Just because the fans chose not to accept those accusations doesn’t make them any less credible than those leveled at McGwire. So, are you prepared to have a Hall of Fame without the likes of Barry Bonds and Roger Clemens, just so you can punish Mark McGwire for not talking about the past? Me neither. Vote him in. 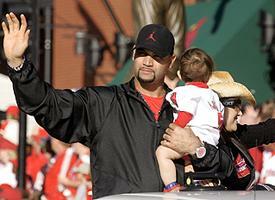 The Cardinals celebrated their 10th World Series championship with a victory parade. 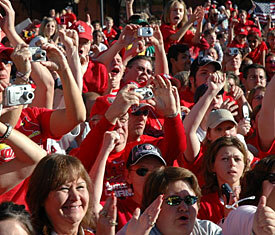 Cardinal fans are the best in the game and probably the only one’s other than the team who thought they stood a chance in this post-season. So, for those of you who weren’t able to attend here are a few images I’ve gathered for your viewing pleasure. Click Here and Here for even more images of the parade and rally. Enjoy!